Chef Jean-Louis Gerin of the award-winning Restaurant JEAN-LOUIS in Greenwich, Connecticut shares his culinary vision and a delicious taste of the restaurant with his tempting recipes for Stone Crab with Tomato Crumble, Drunken Red Snapper and Warm Fingerling Potato Salad, Beef Cheeks Slowly Braised in Red Wine, with Onion Compote and Foie Gras, Double-Baked Vegetable Compote, and My Grandmother's Chocolate Mousse that will have you dialing the telephone to make a reservation at the restaurant. 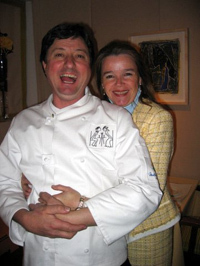 Meeting with Master Chef Jean-Louis Gerin in late February 2010 before having dinner at Restaurant JEAN-LOUIS in Greenwich, Connecticut, I had the opportunity to really get to know this charming chef, although I have thoroughly appreciated his food for years. Growing up in France, Jean-Louis Gerin grew up with an appreciation of good food from his parents and grandfather. Although his mother cooked every day for the family, it was his father, who was an amateur cook and only cooked for the family on Sunday, who inspired him. His father would think about what he would make on Sunday and then talk about it all week. When Sunday finally arrived, the family eagerly anticipated the much talked about meal. Cooking, when done well, is an art form, it is about building up expectations, teasing your guests' palates beginning with the amuse bouche and leaving them satisfied with the dessert, and then tempting them yet once again with mignardises so that they will want just a little bit more; having experienced Restaurant JEAN-LOUIS, Chef Jean-Louis has indeed learned his craft well. When he was 13 years old, he had a summer job at the legendary Michelin three-star restaurant Auberge du Père Bise, where he was responsible for drying the Baccarat glassware, a very responsible position for such a young man. Working with Mr. and Mrs. Bise, who would gently tease him if she heard the glasses tinkling, asking, "Are you calling me?" that he learned about the art of fine dining. It was here that he had his first taste of caviar and cheval blanc Bordeaux, and he remembers Mrs. Bise telling him that she hoped that he would have the opportunity to drink a lot of it in his life. Inspired from his summer experience working with Père Bise, after he completed his preliminary education, he attended the Hôtelière de Thonon Les Bains where he received formal restaurant training and a business degree. Upon graduation, he returned to work at Auberge du Père Bise, followed by work at Oustau de Beaumanière, another three-star restaurant in France. As if by fate, he went to work at a new restaurant, Barrière de Clichy, where he met Guy Savoy, who has become a lifelong friend. Two years later, Jean-Louis and Guy Savoy opened the restaurant, GUY SAVOY, on Rue Duret in Paris, where Jean-Louis became Savoy's Chef de Cuisine. (The new restaurant GUY SAVOY, a three-star Michelin, is on Rue Troyon in Paris). 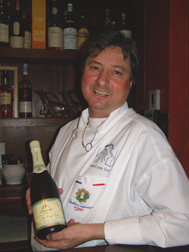 In 1983, Guy Savoy came to the United States to open a restaurant in Greenwich, Connecticut, and in 1984, Jean-Louis joined him. 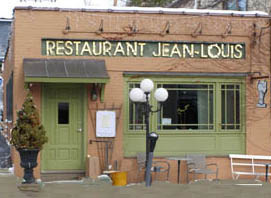 By 1985, Guy and Jean-Louis agreed that Jean-Louis should purchase the restaurant, and named it Restaurant JEAN-LOUIS. Through another stroke of fate, on Mondays when the well-known restaurateur René Chardain would close his own restaurant, he would come with his wife to dine at Restaurant JEAN-LOUIS. After a time, it occurred to Mr. Chardain that perhaps it would be interesting for Jean-Louis to meet his daughter, Linda. The meeting was very successful; he married Linda in 1986. The couple has two sons, one who has a great palate, and one who loves to play in the kitchen, so perhaps there will be another chef in the family some day. Although she is the general manager of Restaurant JEAN-LOUIS, Linda is no stranger to the kitchen, as she was trained as a chef and was her father's sous chef. Together, they have built a fine reputation for their intimate restaurant, where the ambience is attractive and welcoming, and has garnered many accolades and awards throughout the years. His many achievements include Maitre Cuisiner de France - Chevalier du Mérite Agricole (Master Chef of France) 2001; Best Chef Northeast "James Beard Foundation 2006; and The Silver Toque, Master Chef of France 2009 which holds a place of honor on the Chef-Bar at the restaurant. Chef Jean-Louis graciously shares his delicious recipes for a five-course menu. Bon Appetit! Method: Heat three tablespoons of the olive oil in a large skillet over medium heat. Add onions, thyme, salt and pepper to taste, and cook, stirring occasionally, until onions are caramelized and dark brown, about 45 minutes. Note that as onions start to brown, it may be necessary to reduce heat to medium-low, stir more frequently, and add a knob or two of butter in order to prevent burning. Set caramelized onions aside. Meanwhile, preheat oven to 350° F and, if using fresh plum tomatoes, bring a medium pot of water to a rolling boil. Prepare a large bowl of ice water and set near stove. Using the point of a sharp paring knife, remove and discard stem end and cut an ‘X' into other end of each tomato. Submerge one or two tomatoes into the boiling water for 10-15 seconds or until skin begins to peel off. Using a slotted spoon, quickly transfer the tomatoes into a bowl of ice water. Repeat process with remaining tomatoes. Peel skins off tomatoes and discard, and then cut tomatoes in half lengthwise, and scoop out and discard seeds. Cut tomato halves in thirds lengthwise to form approximately ½" strips. Mix flour and ground almonds in a medium bowl. Use your fingers to mix in 5 tablespoons of the softened butter until just incorporated. 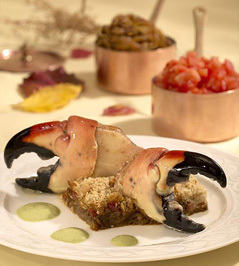 Method for the Stone Crab: Dust with soft spices and reheat slowly with a soupcon of butter and olive oil. Method: Place potatoes in a medium pot of heavily salted water, bring to a simmer over medium-high heat, and simmer until potatoes are cooked through, 10-12 minutes. Drain, peel, and cut potatoes into ¼"-thick slices. Set aside. Season flesh-side of fish with salt and white pepper and set aside (do not season skin-side). Bring 1½ cups of the white wine to a boil in a wide sauté pan large enough to fit all four red snapper fillets. Boil thirty seconds to remove the alcohol, and then add the onions and the red snapper fillets (skin-side up). Cover and reduce heat to low. Simmer until the fish is cooked and the skin is shiny, about 5 minutes. Remove fish from the pan, set aside, and loosely cover with aluminum foil. Increase heat to medium-high and boil fish cooking liquid until reduced in volume by half, 4-5 minutes. Transfer liquid (with onions) to blender or food processor and blend with the butter and 4 slices of potato until smooth. Bring remaining wine to a boil in a small saucepan over medium heat. Add the remaining slices of potato, and heat. Add the heavy cream and the blended fish cooking liquid, and carefully stir to mix well and allow to heat through, but do not boil. Presentation: Place two romaine leaves on each plate. 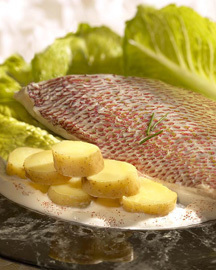 Divide potatoes evenly among plates, then top potatoes with the red snapper. Drizzle fish with emulsified sauce and sprinkle with chives. Method: Preheat oven to 325° F. Bring wine and thyme to a boil in a medium saucepan set over high heat. Boil until reduced by half (to about 1½ cups), about 15 minutes, then set aside. Pat beef cheeks or brisket dry with paper towel, then season with salt and pepper on flesh (not fatty) side. Heat 1 tablespoon of the olive oil with 1 tablespoon butter in a medium, heavy-bottomed pot set over medium-high heat. Brown meat well all over, starting with fatty side down and finishing with fatty side up, about 5 minutes per side. Without removing meat from the pot, pour off and discard fat. Return pot to medium-high heat and add the reduced red wine, garlic, and bay leaf. When liquid boils, add the veal stock. Bring to a boil, and then transfer pot to the oven. Cook uncovered for half an hour, and then cover and continue cooking until meat is extremely tender, 2½-3 hours. Method to Caramelize the Onions: Heat remaining 3 tablespoons olive oil in a large sauté pan set over medium heat. Add the sliced onion and cook, stirring occasionally, until deep brown in color, 30-45 minutes. If onions start to dry out, add a knob or two of butter and stir more frequently. Presentation: Slice the beef cheeks or brisket. Layer slices of meat with caramelized onion and foie gras in each of four bowls. Adjust seasoning of the cooking sauce to taste with salt and pepper, and drizzle over the foie gras. Note: At the restaurant, we of course use our rich homemade veal stock! However, if you don't make your own, this recipe works well with the "Perfect Additions" brand of frozen veal stock; merely defrost the stock and use it full strength (do not dilute, despite what it may say on the container). 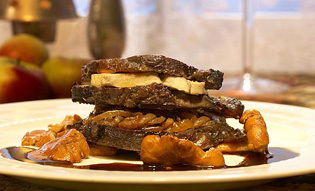 Slices of fresh foie gras can be found at most gourmet markets - use as much or as little as desired! Method: Preheat oven to 350° F. Heat ½ cup of the olive oil in a large pot over medium-high heat. Add garlic and cook until just starting to turn lightly golden, about 2 minutes. Add the onions, bay leaf, thyme, and allspice, and cook, stirring frequently, until softened and starting to turn translucent, about 5 minutes. Add the yellow squash, zucchini, eggplant, and cook, stirring occasionally, about 10 minutes. Add drained diced tomatoes and roasted red peppers, stir, and place pot in oven. 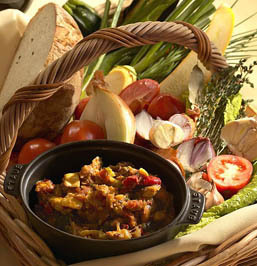 Bake, stirring every 10 minutes, until vegetables are fully cooked, about 45 minutes. Let cool and refrigerate overnight. The following day, prepare the plum tomatoes: bring a medium pot of water to a rolling boil. Prepare a large bowl of ice water and set near stove. Using the point of a sharp paring knife, remove and discard stem end and cut an ‘X' into other end of each tomato. Submerge tomatoes, 2-3 at a time, into the boiling water for 10-15 seconds or until skin of tomatoes begins to peel off near the ‘X'. Using a slotted spoon, quickly transfer tomatoes into bowl of ice water. Peel skins off tomatoes and discard, then cut tomatoes in half lengthwise and scoop out and discard seeds. Cut tomato halves lengthwise into approximately ¼" strips, then cut strips crosswise to form approximately ¼" square pieces. Heat the remaining 1-tablespoon of olive oil in a large saute pan over medium-high heat. Add the ratatouille, season to taste with salt and pepper, and cook, stirring occasionally, until excess liquid is evaporated, about 20 minutes. Fold in the plum tomatoes and herbs, and cook until heated through, 1-2 minutes. Serve warm. Method: Melt chocolates together in a heatproof bowl set over a pot of just-simmering water. In a large bowl, beat the egg whites, starting on low speed and gradually increasing to high speed, until they form soft, wet peaks. Gradually sprinkle in sugar and continue to beat on high speed until whites are firm and glossy. Remove the bowl of melted chocolate from the pot of water and whisk in one third of the beaten egg whites. Gently fold in remaining whites in thirds until mixture is homogenous. If desired, divide mousse evenly into individual serving bowls. Cover and refrigerate overnight. Note: It is not absolutely essential to use a high-quality bitter chocolate, but the texture of the mousse will be much more luxurious if you do! Using a lower-quality unsweetened chocolate such as Baker's will give the mousse a slightly chalky texture. Please note that this chocolate mousse is incredibly light and simple, it must be refrigerated 2 days before serving, and kept covered with plastic wrap. Presentation: Use a warm soupspoon. 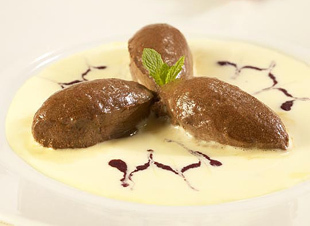 Do not try to make perfect quenelle, simply scoop and serve quickly. 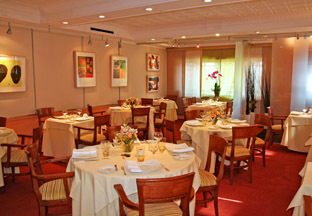 Read about Restaurant JEAN-LOUIS in the Restaurants section. Read other articles on Stamford, Connecticut and the surrounding area in the Destinations, Hotels and Resorts, Restaurants , and Arts sections.